While sailing on high seas, one needs to have a compass lest he loses his way. Our lives with all their challenges and twists and turns are no less complex than sailing on high seas. While dealing with these day-to-day challenges, we lose sight of our way and float randomly towards an unknown direction in an uncontrolled manner. Most of the time we are so pre-occupied with our daily chores that we do not have time to ponder about the direction our lives are leading to. Rarely when we have the luxury of thinking about our lives, we find ourselves handicapped to think clearly as we are unable to find a lighthouse to guide our thoughts. In absence of a suitable framework for guiding our thought process in the right direction, we find ourselves at sea and wish there could be some way to resolve complex issues that we face. The model proposed here is intended to resolve such complex issues that we face as an individual, as a society or as a nation. I wish to call it the ‘Tripod Framework’ as it has three legs dealing with three spheres in which our lives operate. First and foremost, we must ensure our existence. Therefore, the Economic Sphere (ES) deals with acquisition of everything that is necessary for our survival in this world. If we don’t have food or shelter, we may die. If we do not have medical facilities, then also we may not be able to survive. Same is true of many material goods and services as unavailability of such goods and services would jeopardise our existence. Pursuit of all such necessities of life can be called our ‘Economic Sphere’. Having ensured that our existence is not at risk, we must strive to enrich our existence. How do we enrich our lives? We don’t want to just live, we want to live happily. All our activities in pursuit of happiness can be broadly categorised as our ‘Spiritual Sphere’ as such activities provide food to our souls. Don’t get misled by the nomenclature. Here word ‘Spiritual’ is being used in a broad context to include all kind of activities which yield happiness and give meaning to our lives by enriching our existence. Therefore, Spiritual Sphere would as much include activities like, sports, music, theatre, social work, literary activities, arts etc. as much as it would include religious and other conventional spiritual pursuits. To be able to perform our activities in the Economic Sphere and the Spiritual Sphere, it is necessary that we must have an atmosphere which is conducive to unhindered pursuit of our activities in these two spheres. Therefore, we have another sphere of our life which ensures that obstacles in our path for free conduct in the first two spheres are minimised. I call this third sphere as the ‘Socio-political Sphere’. This consists of all social and political structures and institutions which are necessary to establish an atmosphere of peace and harmony to facilitate activities in the first two spheres. Our activities in this third sphere are necessary to strengthen these social and political structures and institutions like family, community, governments etc. The three spheres are interdependent and are held together through a symbiotic relationship. If we do not perform enough in Economic Sphere, our physical well-being would be jeopardized and we shall not be able to achieve any progress in other two spheres. If we neglect our activities in Spiritual Sphere, our life would become worthless and this will adversely affect our motivation to perform in the Economic Sphere and the Socio-political Sphere. Further, if we neglect our responsibilities in the Socio-political Sphere, the social and political systems and institutions would degenerate gradually and our environment would get vitiated. 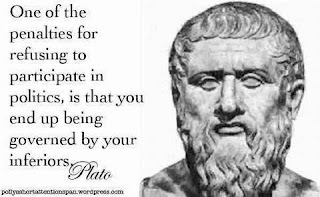 This will prevent us from effectively conducting ourselves in the other two spheres. As a result, we will not only jeopardise our own existence but also foment chaos in the society. While the three spheres are interdependent, at the same time, their nature and character are quite distinct. As the three spheres address issues in three distinct dimensions of our existence, their cores are very different. The three spheres do interact but the interactions happen only at the boundaries. At any given point in time and at a particular stage of life, the three spheres carry unequal importance. Realization of the relative importance of the three would help in setting right our priorities in life. First and foremost, we must ensure our physical existence. Therefore, till sufficient degree of economic well-being is achieved, we should give top priority to the Economic Sphere. However, once we achieve reasonable degree of economic progress, any further progress in Economic Sphere does not add much value to our life. When such a stage is reached, our focus should shift to the Spiritual Spheres as that is the only way we can enrich our lives and achieve happiness which is necessary to give meaning to our existence. Again there could be occasions, like a natural disaster or a war, when we should shift our focus to the Socio-political Sphere to ensure that the well-being of our Socio-political system is not compromised. Priorities change as we progress is our lives. As a child we had all play and no work. Therefore, we were engaged only in the Spiritual Sphere. Then we had to go to school (an economic activity) and we were gradually shifting our focus to the Economic Sphere. Then we got employed and married. As our responsibilities increased, we had to ensure that supply of material goods and services necessary for survival of self and family were provided. Thus we were mainly focussed on the Economic Sphere but as we were also concerned about our family, we were also operating in the Socio-political Sphere. As we grow further, economic needs take a back seat and the urge to engage in the Spiritual Sphere grows. Therefore, when this stage is reached, we should try to develop some hobbies or engage in religious and spiritual endeavours. We should not rest with achievements only in Economic and Spiritual spheres. Once we achieve a fulfilling and meaningful existence in life, we ought to give due attention to our duties in the Socio-political Sphere. In a society where due importance is not given to the Socio-political sphere, the social and political institutions would get dominated by people of lesser intellectual capability and of doubtful integrity and such a situation would be detrimental to the well-being of everyone. In the old age, when our capabilities of performance in the Economic and Socio-political spheres are inadequate, we can shift our focus towards the Spiritual Sphere. Thus life began with the Spiritual Sphere and it should also end with the Spiritual Sphere. In classes of management schools, the students are taught that we must do segmentation analysis before we attempt to design a product. For an effective and useful product, it is necessary that the product should address the needs of a particular segment only. Any attempt to address needs of multiple segments would reduce utility of the product. Similarly, the three spheres of our lives are the three distinct segments of our existence. 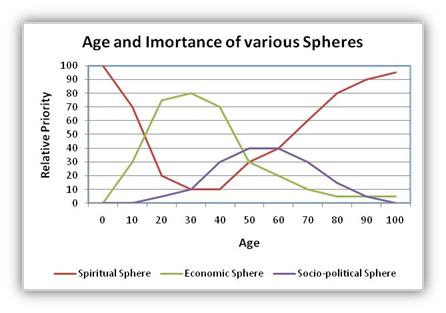 Though, all the three spheres of civilization are interdependent, their cores are very distinct. Any ideology, to be effective, must respect this distinction and focus on only one of the three spheres. 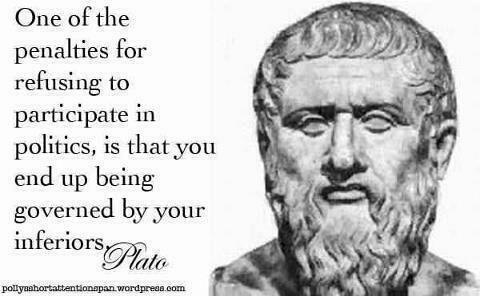 Unfortunately, many of the ideologues were oblivious of this distinction and have preached ideologies encompassing multiple spheres of our lives. As a result, such ideologies have failed to address the real issues and created great deal of confusion and conflict causing misery to their followers as well as others. All such Khichdi (cocktail) Ideologies are cause of much of the conflict and violence that we see in today’s world. One of such Khichdi Ideologies is Marxism/Communism. Though, it is aimed at ameliorating the problems in the economic sphere, it also ventures into the Socio-political sphere and makes exhortations for violent revolution. The result is there for all of us to see. Millions of lives have been lost without any success in achieving the desired objectives of equity and justice for the poor. The Jihadist Ideology is another such ideology. It straddles between the Spiritual Sphere and the Socio-political sphere and prescribes creation of a universal caliphate (essentially a political institution) by forcing every human being to convert to Islam through coercion. The result, again, is disastrous. The Buddhist philosophy is much appreciated worldwide for its message of peace through Ahimsa (non-violence). But again, followers of Buddha extended the doctrine of Ahimsa beyond the Spiritual Sphere to include the Political Sphere. As a result, a strong tradition of warrior-ship and military art was lost leading to centuries of subjugation of the country by foreign invaders. The plight of Tibetans in today’s world is the manifestation of the same mistake. Governments operate in the Socio-political sphere and therefore, should focus on that only. However, that does not mean that the existence of the other two spheres should be ignored. In fact, the existence of the Economic Sphere and the Spiritual Sphere should be considered in policy formulation to avoid any adverse consequence in those spheres. Therefore, policies should be formulated ensuring that they do not adversely impact activities in Economic Sphere and neither should they create conditions which render pursuit of activities in the Spiritual Sphere difficult. Objective of State Policies should be to create conditions which facilitate freedom of citizens to pursue activities in Economical and Spiritual Spheres. In my earlier post (Marxism: A Historical Mistake), I have suggested that the state has a limited role in the Economic Sphere i.e. to ensure adequate competition. If sufficient competition is not there, the state must regulate the market. Apart from that, state should resist temptation to indulge in the Economic Sphere. However, we must be alive to the condition of vulnerable sections of the society who, due to severe poverty, are unable to sustain activities in the Economic Sphere. Therefore, some kind of hand holding may be necessary in such cases to ensure that they survive till benefits of the free economy reach them. The hand holding should be in the nature of providing adequate work opportunity and not in the nature of freebies which render the beneficiary dependent on state largesse forever. Some governments, without realising that their role is limited only in the Socio-political Sphere, extend their activities to also encompass the other two spheres namely economic and spiritual spheres. This adversely affects citizens’ freedom to act independently in these two primary spheres of their lives. Such intervention by these governments may have grave consequences on the well-being of the citizens and the society. For example, communist governments control every form of activity in the Economic Sphere, leaving very little freedom for citizens to innovate and improve efficiency. Such economic system cannot be sustained for long. Further, communist governments totally prohibit/regulate activities in the spiritual domain. Such restraints on the spiritual activities make the citizens’ life dry and worthless. To ensure sustainable and enjoyable life, it is necessary that citizens be given full freedom to act in the Economic and Spiritual Spheres. In respect of these two spheres, the role of the Government should be that of a facilitator only. This would explain why a religious state e.g. a Hindu Rashtra or an Islamic (sharia) State would not be such a good idea.